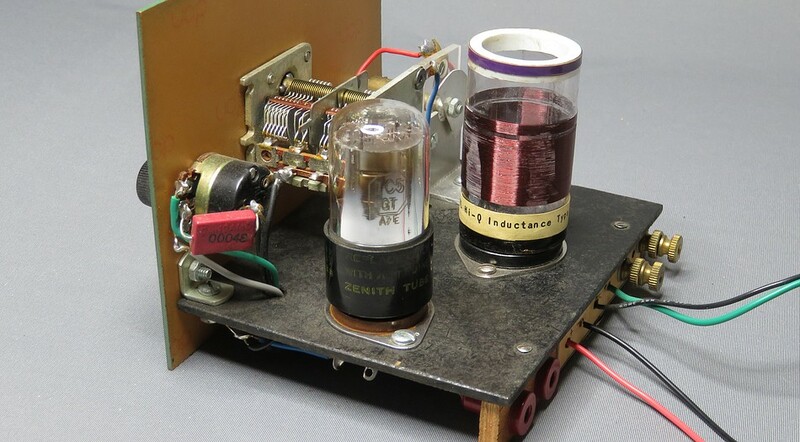 In 1940 Elmer took a break from crystal sets and developed the MRL 1 Tube regen radio. The circuit is a typical regen but Elmer claimed he perfected the layout of the parts. 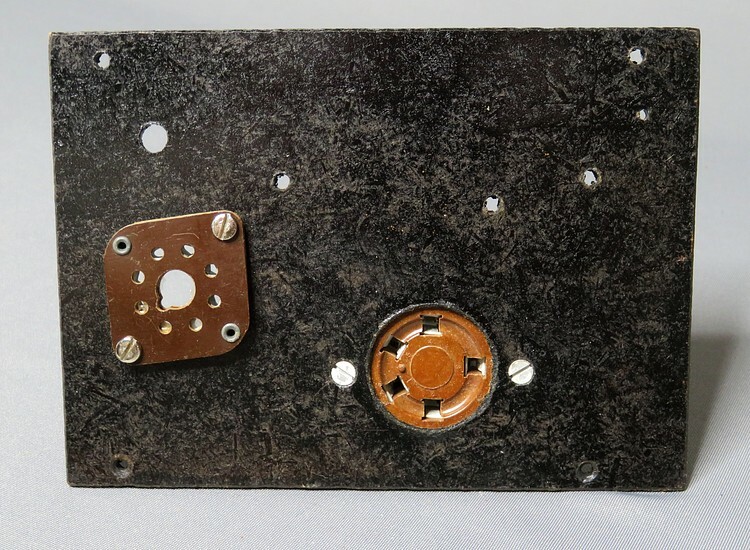 He made a six page mimeographed "blueprint" named BP-2 which described the radio, but after selling thousands of these the stencils disintegrated. 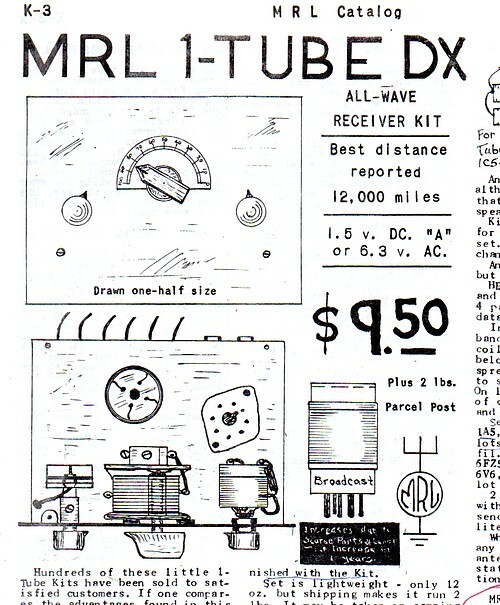 He then came out with HB-4, copyright 1954, "MRL 1-TUBE D.C. ALL WAVE RECEIVER." The handbook describes every aspect of the radio and how to make every part of it. All data is included for making the plug-in coils. Why gather all the parts and make the coils when you can just buy the kit from MRL? 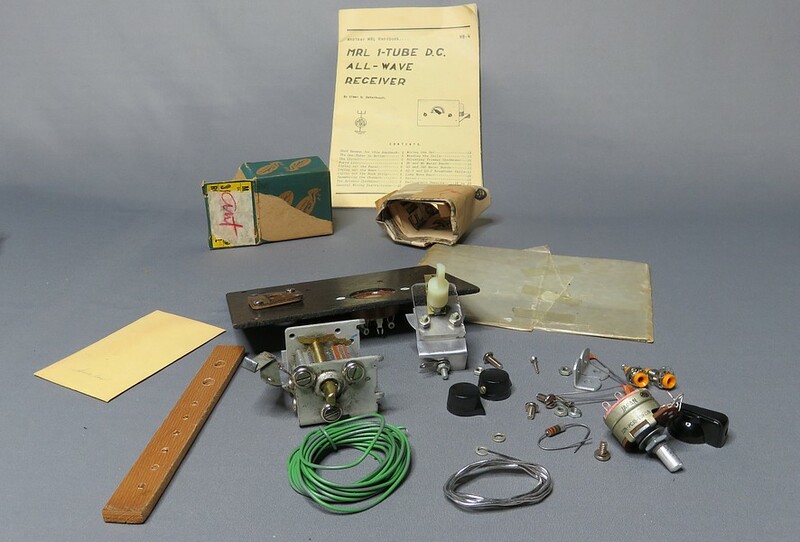 The kit came with two coils for the AM broadcast band but you had to buy the tube separately. Most tubes were $1. If you didn't want to build the kit, Elmer would build it for you for $3. Oddly, this circuit was obsolete by the time Elmer made the handbook and kit. One tubers had gone out of style because they oscillate through the antenna and wreak havoc with other radios. The MRL 1 Tube radio works very well but requires patience to tune. Like a crystal set, it needs a set of high impedance headphones. 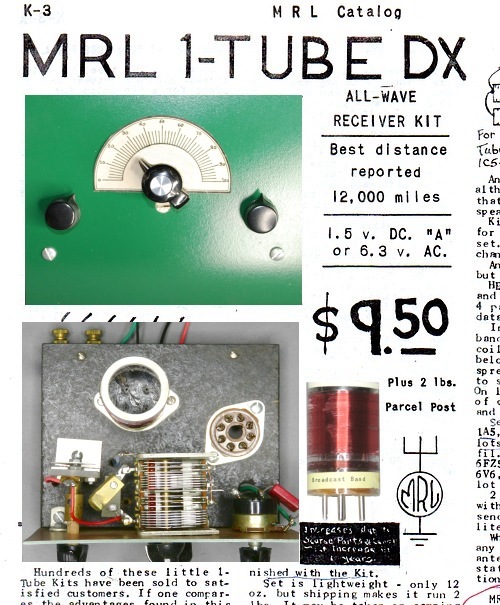 There are other MRL 1 Tube examples on this site. Just hit the BACK button on the bottom of the next page. Here you can one of the changes made during the years. 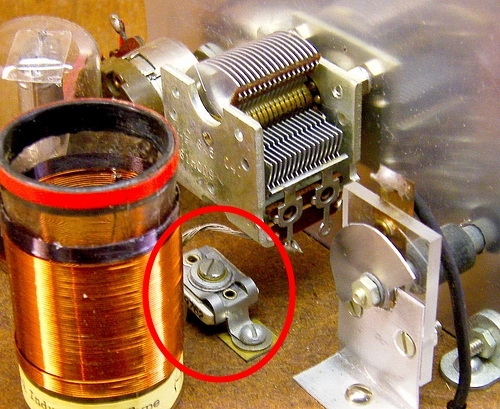 When Elmer could no longer obtain 140 pF variable capacitors, he used a trimmer in series with a 350 pF cap. Notice the trimmer on the left is also shown in the drawing at the top of the page. 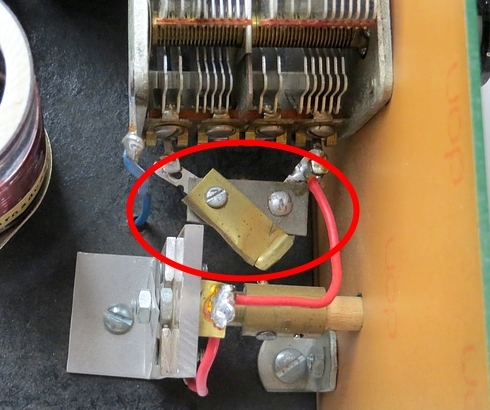 Later, he obtained two-section capacitors. 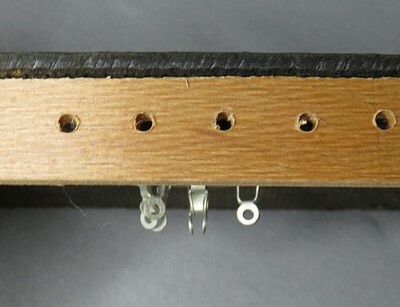 He added an MRL-made switch to switch one of the sections in or out. 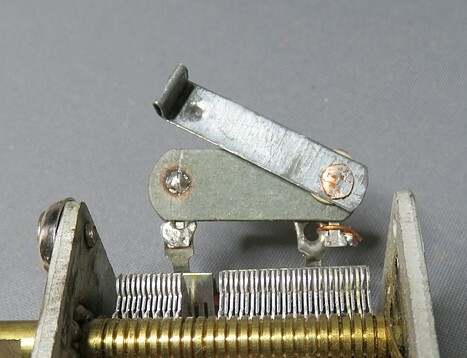 The switch is closed for the AM broadcast band and open for shortwave. An unassembled MRL 1 Tube kit from 1980. 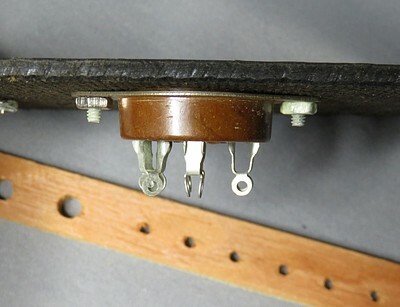 MRL antenna tune capacitor. MRL switch. "Compo." 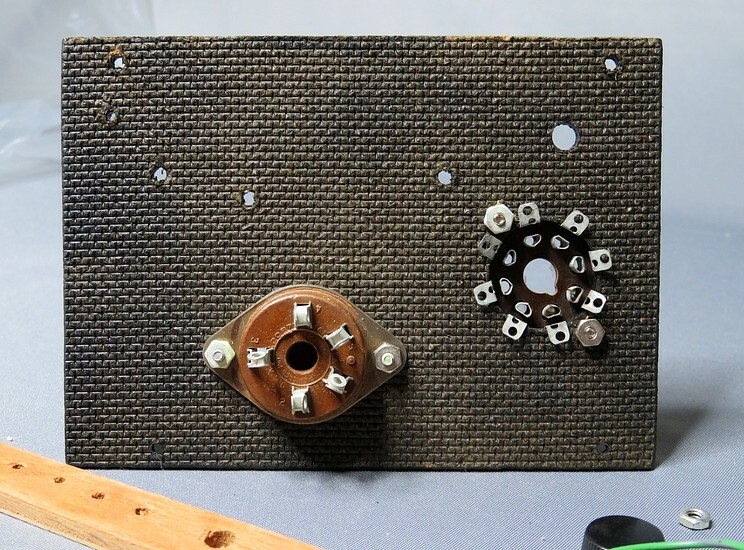 base with parts mounted by Elmer Osterhoudt. 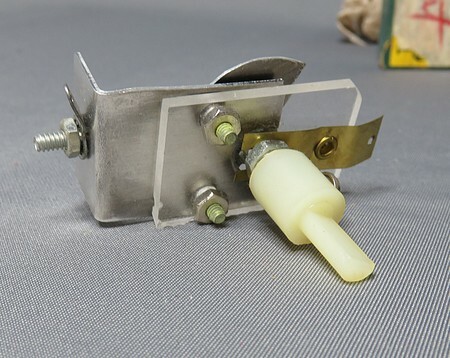 If this kit is ever assembled, the coil socket will need to be moved to the top of the base because the leads are too long. 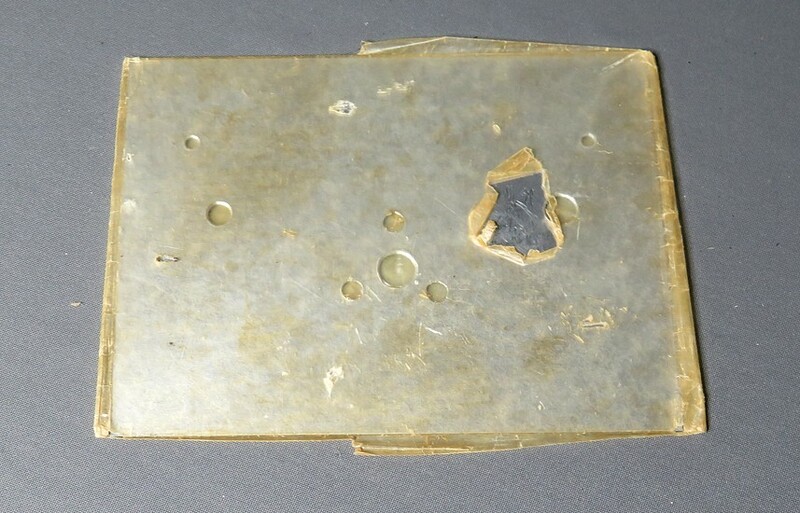 Elmer (or Mabel) wrapped the front panel in waxed paper. Something has gone through the paper and scratched the panel. No worries; in the instructions Elmer says to sand it and paint it.